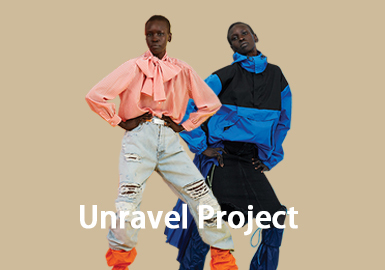 Unravel Project is a new fashion brand in Los Angeles. It often breaks traditions to create something new. The bomber jacket and leather pants designed by unravel project are favored by many models and fashionistas. Street fashion is the major style. Its splicing is eye-catching and unique. In the new collection of 2019, the bold deconstruction and colors are appealing.